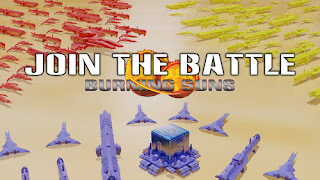 Burning Suns is an intense tactical science fiction game set in an expansive universe, where you'll be competing for supremacy through technology, diplomacy, exploitation, and destruction. Tactical 4X thematic action > Burning Suns is not a traditional 4X game. It takes the 4X actions and gives you complete tactical control. This means you'll have to adapt and improvise on the way to victory. A strategy can only take you this far, in the meantime you'll have to rely on your abilities to analyse the situation and calculate the best possible moves ahead of you. Being able to force, trick, and outmanoeuvre your opponents is key to success. Seize opportunities as they arise and don't wait for the perfect moment - because it doesn't exist! It's about being proactive and reactive according to your chances and the risk you're willing to take! Create an Empire > You'll be able to create no less than 343 possible empires, using the 3 elements of Ideology, Race, and Structure. All with unique strengths and weaknesses. Galaxies in motion > Galaxies can be created just as you see them fit. And they might evolve during a game. Immediate actions > The order in which actions are executed will change every turn. All actions in Burning Suns are carried out immediately and players are therefore involved throughout the game - bringing downtime to a minimum. Your empire, your strategy > In Burning Suns there are many ways to victory. Depending upon your empire, how you use abilities, leaders and agents, whether you choose to ally or conquer worlds and how you choose to engage your opponents with the many various units.